A few more hours and 2014 will be history. It’s been a good year for the new railroad with steady progress being made. I’m quite pleased about that. I really wasn’t sure how things would work out with the new arrangement of building in my daughter’s basement instead of my own. But it has worked surprisingly well. I see no changes in the coming year with my schedule. I wish y’all a great 2015 and progress on your own railroads. What a great hobby we share! It seems like many are reviewing their stats, sent to us courtesy of the blog itself. Mine are 10,462 views resulting in 238 comments from folks in the US, CA, AU, UK, and Germany. It certainly has been enjoyable in corresponding with many of you and I appreciate your support and encouragement. Thank you all. This week I did get a few hours working on the railroad itself. I turned my attention to the overpass that is at the end of the Calais Yard throat. 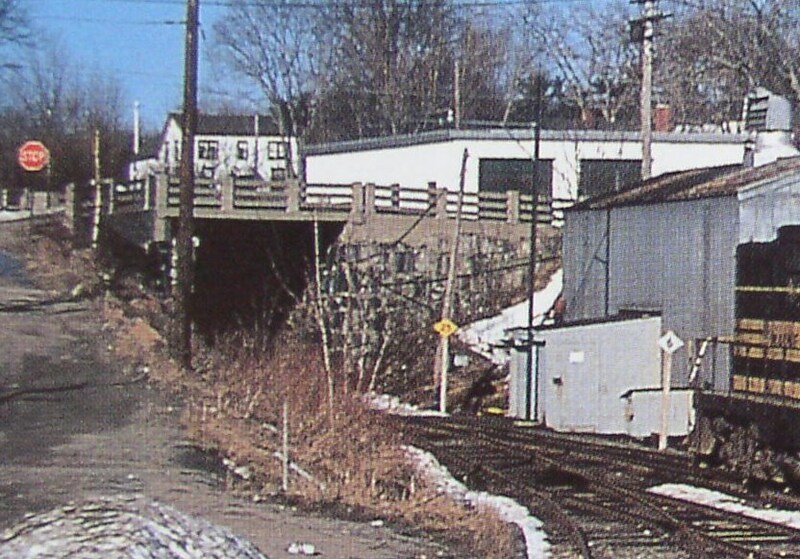 This overpass carries Main Street over the rails and leads to the customs booths at the entry point to St. Stephen, New Brunswick. 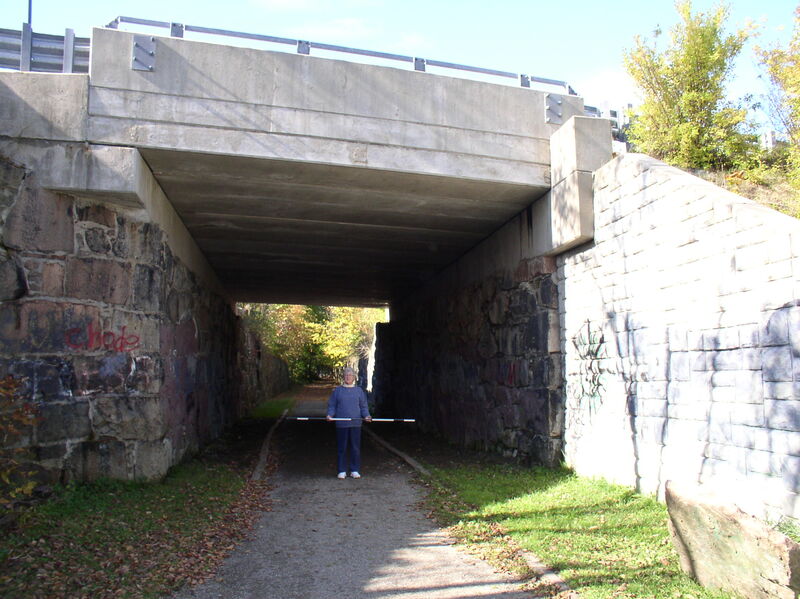 While looking like a normal bridge over the track as viewed from the yard side, it could actually be classified as a short tunnel because it extends beyond the width of the road. About three years ago we were passing through town on our way to visit relatives in NB. So we stopped to take a series of measurements of structures that are still standing. We use a combination of photos taken with a measuring rod that is marked off in feet and half-feet using alternate colors. Note that the bridge has been rebuilt on top of the old foundation using poured concrete. This is too modern for our era, so we will revert to an earlier time when girders were used to support the bridge deck. Protection was provided by concrete fencing, both posts and rails. There is a gas station in the background which has changed hands many times over the years of its existence. It has also changed appearance. Our model will depict it as an Esso station. More on that some other time. We are only as far as a test fitting of the basic structure which involves getting the final perspective right. It’s the common problem of never having quite enough room compared to the prototype. Our wish for you is a happy and rewarding new year in 2015. Hopefully we will talk to you then. I got to thinking about team tracks this week. They were of much importance in the previous generation. Usually the only team track use I see today is occupancy by the railroad that owns it for their own use. The last time I personally saw one being used was in 1961 in Greenville OH, where several wagon teams of Amish farmers were picking up the materials for a new barn out of a pair of boxcars. This week I was reminded twice about the subject. I was doing some history write-up for the folks that purchased our old family summer home on Cape Cod. The year the home was built was 1928 and I was telling them that it had been built from a precut kit that had been shipped from the Midwest to the team track in Provincetown at the end of that New Haven branch. They had no idea things like that were done beginning in the 1920’s. Ours came complete, precut wood, windows, hardware, screens, fasteners, etc. in one boxcar. The total cost for everything including shipping was $827. Wow, those days are gone! In documenting my story, I came across the following photo of such a load being unloaded at some destination. My father and a friend assembled everything. If you want to explore this subject further, Google the Gordon-Van Tine Company. You will see that it was a huge business that supplied homes all over the USA. Sears had their own home construction business in competition. Once you look at the various designs available in the catalogs, you will recognize those same styles in almost every town across the country. The other reminder I got was when I was reading a book about the Newfoundland Railway and how it served its customers, many of who lived where there were no roads. 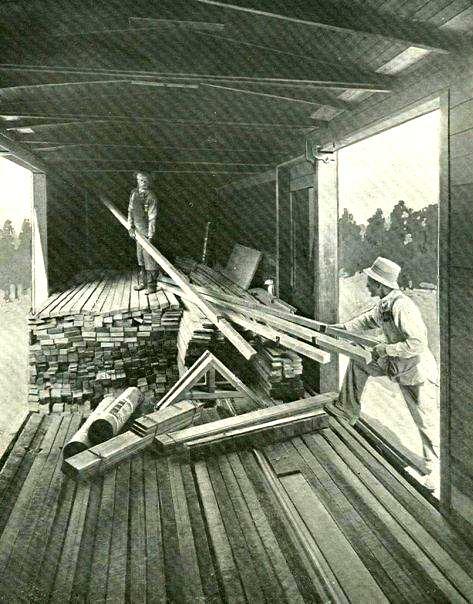 There were several photos of people receiving precut stacks of lumber for projects. Some of the loads were small enough that they were just handed out of the baggage car during a station stop. What has this got to do with my MEC railroad? Well, Calais had a team track that worked for both loading and unloading depending on the circumstances. In one case empties were placed there to receive hand loaded pulpwood logs from a small operator who had no other service. Eastport also had a team track that was rather long. There was a road beside it that allowed trucks to move along the line of cars to get what they needed. Many of the businesses were along the waterfront with no rail access. The team track was over a mile away, so trucks were used for the transfer. Team tracks are great because they allow us to break the sometimes monotony of having a regular car show up at the same factory door during operations. They bring us back to the days when railroad service was more personalized. This week has seen limited progress on the railroad due to family Christmas prep and other necessary chores. Not a surprise this time of year. However, in the separate shop work has continued on the first of two CN reefers as time has allowed. This one is the 8-hatch style. Since my shop is at home and the railroad is some distance away, the reefer has gotten my attention. It is now almost to the primer stage. The primer coat will show up any areas that need a bit of putty to cover any defects. It will also give me a surface on which to place a rivet strip on the panel over the door. These are Archer rivets that apply like decals over a painted surface. 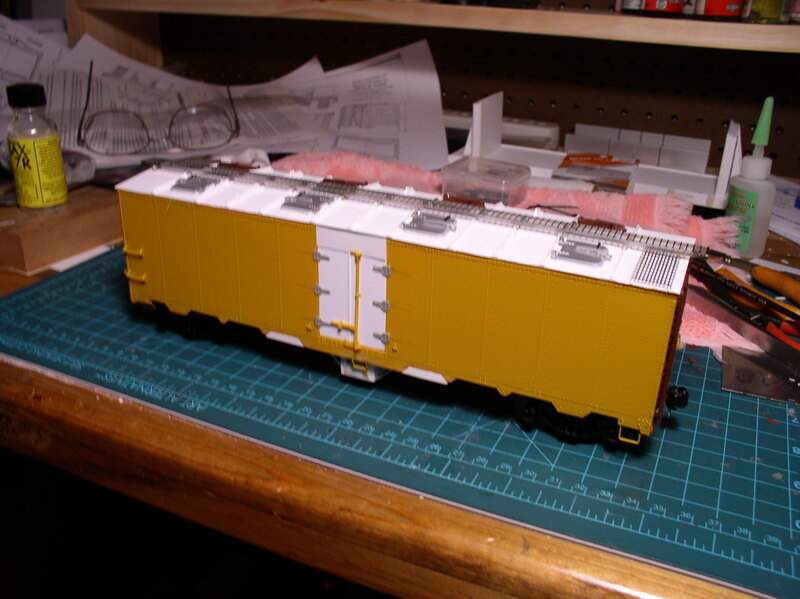 As you can tell, the starting point of this project was an Intermountain steel reefer kit. A charcoal heater has been placed under the door on one side. This particular feature is a prominent detail which is necessary for a good recognizable model. The second reefer, soon to follow, will be one of the CN’s 50′ mechanical reefers. This one will pretty much need to be scratch built, as I have very few parts on hand that will lend themselves to the project. There are quite a few louvers in the car body and the sliding panels in front of the refrigeration unit. Fortunately Archer also makes louvers in their decal line. I’m looking forward to the benefit that will provide. 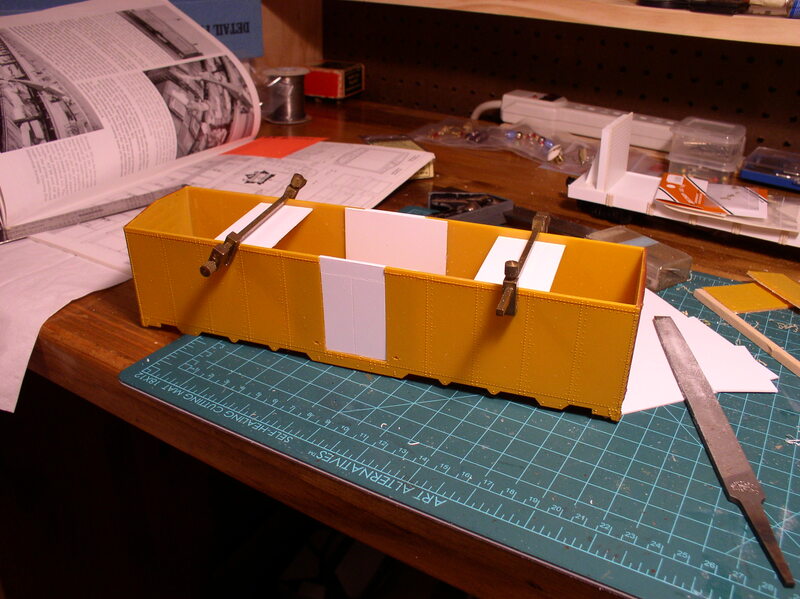 The last time I made O Scale louvers I used a widely spaced tooth file called a float file. The styrene was placed over the file and then a heated brass plate the size of the area needed was pressed into the styrene, softening it and pushing it into the file. It made pretty good louvers, but the process was quite tedious to say the least. I wrote about this method many moons ago in O Scale News. These were the days when almost everything in styrene was hand cut and formed. No Evergreen back then. Those of us who still want to build are certainly blessed today with many available detail parts and special materials. The Intermountain sides have been modified to reflect the Canadian Body. The door opening has been widened to take a 5 foot wide set of doors. The doors on this car are short to give clearance for the brine equipment inside the roof. The doors then are 7 feet tall with a cover panel above them. The lower edge of this panel has a row of rivets that I plan to add later using the Archer rivet decals. The sill under the doors has been lengthened per the prototype. Hardware consisting of eight rung ladders and grabs will be installed later. The next stage of work for the body is to install the underframe details and brake gear before putting on the roof. It’s a little easier for me this way. 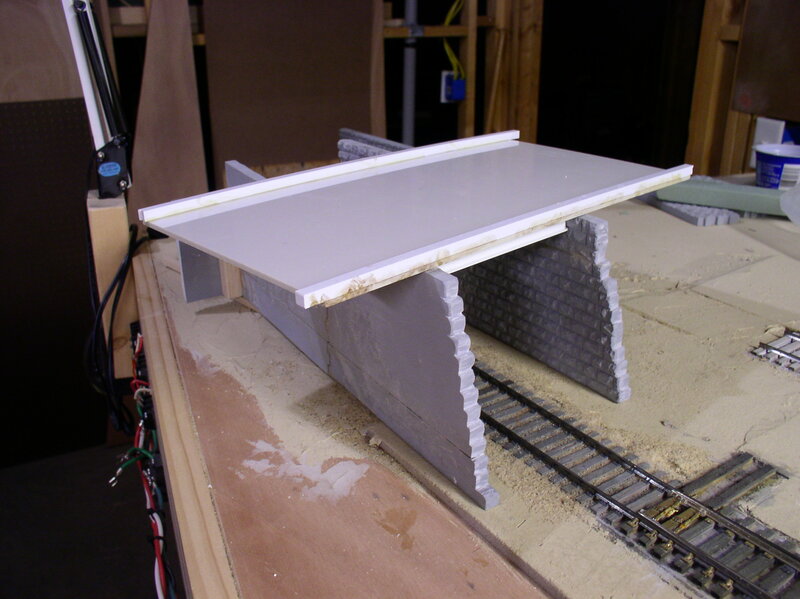 Both the roof and the underframe need protection while the other is being worked on. The roof is being assembled as two flat panels placed side by side. The hatches are a shy smaller than the prototype but not by much. Modifying the Intermountain hatches was a lot easier at this point vs. creating a master and casting them. Note that the handles for lifting the hatches are not driven through as yet. One the roof is in place, they will be driven in to the proper height. The purists among us may pout at my compromises, but don’t forget I am also building a railroad at the same time and I am constantly faced with decisions like this in order to reach an operational railroad in this lifetime. Actually I’m quite pleased that way this ‘surprise’ car is turning out so far. We are still searching for further detail on how this car moved from Newfoundland and Nova Scotia to Eastport. CN handled the original moves, but who it was handed off to and where is still a mystery. Yesterday marked the start of a side project to build a couple of reefer models as mentioned in the previous post. The photo shows the beginning of the CN 8-hatch car. I found the plan while searching my collection of Mainline Modelers for meat reefer information. I found it in the March 1992 issue. The 8-hatch car plans were at the end of the meat reefer article. An odd place to put it, but at least I have it. Even a previous search for the plans came up empty. 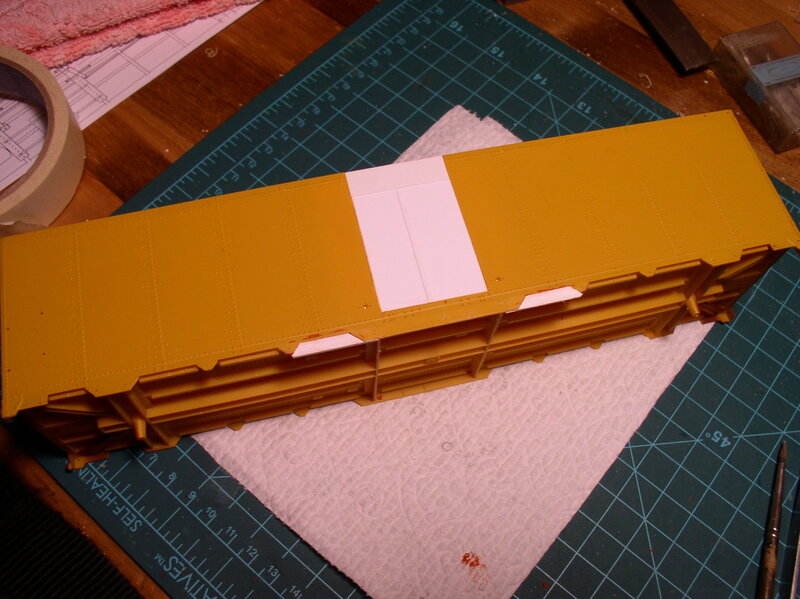 I found that the Intermountain steel reefer kit was a very good starting point. I cut a new door opening to accommodate the prototype’s 7’h.x5’w. door plus the panel above the door opening. Braces have been added inside the body to take the slight warp out of the sides. 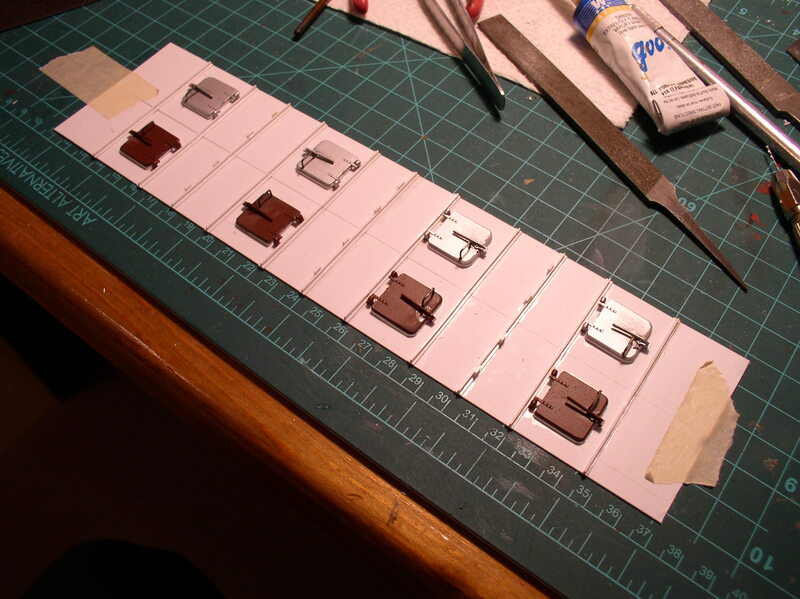 The roof will have to be scratch built with new ribs to provide the correct spacing for the hatches. 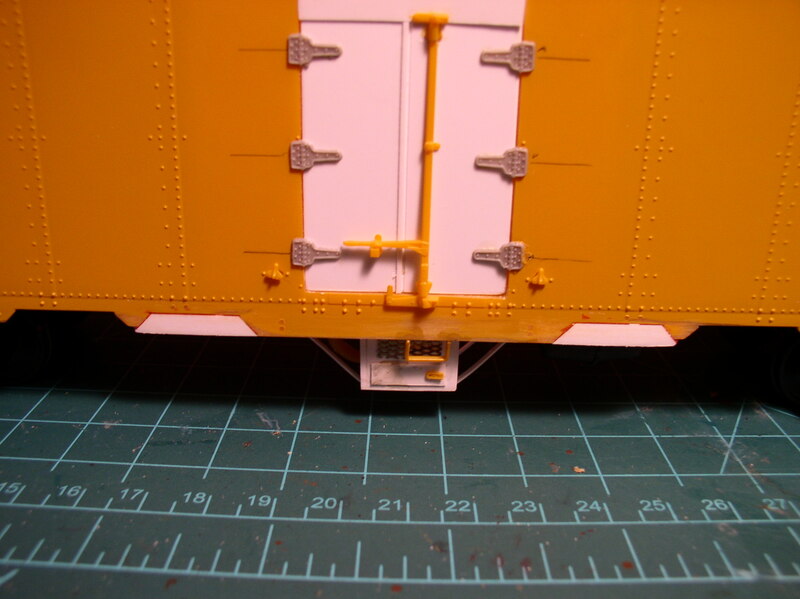 The underframe will be much the same as the kit with the exception of adding the charcoal heater and mounting straps. At this point it looks like both the meat reefer and the mechanical car will need to be scratch as well. I have plenty of parts and materials for both. I also have acquired the lettering for both of the CN cars. This is a necessary factor in today’s O Scale world. Special lettering is quite hard to find and some of the earlier sources have dropped out. Fortunately O Scale is like a helpful fraternity. Those of us who have been around for a while have developed friendships that in some cases are worldwide. In this particular case, some of my CN lettering is coming from a friend in Canada. The meat reefer lettering is not yet secure, but I am hopeful that Protocraft will be adding Armour to their already great selection in the near future. If you haven’t tried Protocraft decals yet, you owe it to yourself to try at least a set. The are exceptionately well done and apply easily. Since realistic operation is planned for the railroad, the research still continues. One of the surprises which has gone beyond the original expectations is the discovery of several moves involving reefers. When I first planned the railroad, I thought operation would consist mainly of various boxcars, covered hoppers, and mostly non-descript tank cars. However a recent interview conducted by a friend opened an old-timer’s memory. He told of instances when various fish products were ordered from Newfoundland and Nova Scotia. In those instances refrigerated cars were used including one memorable time when the car ran out of fuel well before delivery. The routing of these cars could turn out to be quite interesting if we can find further information. 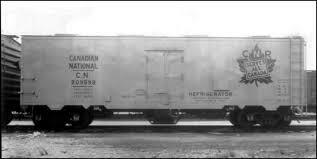 Especially the car originating in Newfoundland, which was CN owned and featured three foot gauge track. This required trading trucks before boarding the ferry to the mainland, otherwise the car was a standard CN reefer. We suspect that the mechanical reefer was a 50′ car with plug door as shown in the photo. Unless otherwise proven, we will choose the more common forty foot 8-hatch reefer as another car. 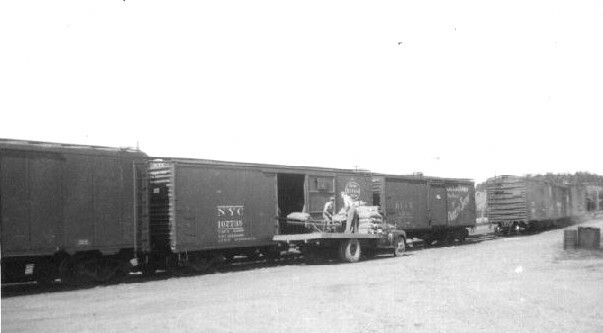 We are assuming that these cars came by way of Bangor and were carried by the Bangor to Calais freight and dropped off at Ayers Junction for delivery to Eastport. For now, this is a pretty safe assumption, because little interchange traffic seemed to come through St. Stephen, NB. In Calais about four blocks south of the depot there was a meat packing operation owned by Armour. Sanford maps identify it as a beef processing plant. It had its own siding. My model unfortunately does not have room for the plant, but we can certainly make room in Calais Yard for an occasional 36′ meat reefer. It will be a refreshing touch once in a while because Calais yard is usually devoid of any freight cars except those delivered to the freight house, log load, and team track. Almost all cars arriving at Calais from Bangor were bound for the two paper plants north of town and were switched out at the secondary yard near the roundhouse where there was adequate room.